19-6-2010: A convicted “Assyrian” GHB/PKK/ADO terrorist for 6 months jail is fully being honored and idolized: is this a sign of falling away and is judgment at hand? 28-1-2009: Sabri Atman and Hezbollah- Aram: Sabri Atman: A man of standards and values or... an manipulator and abuser of the Aramean Physical Genocide to promote the immoral western criminal spiritual colonial and slavery product "Assyrians"? 16-9-2008: The primitive, superseded, yet very dangerous ADO ideology unmasked: Jesus Christ the Assyrian? 15-9-2007: Wikipedia and Fake News about the Aramean nation: the continuation of Western Spiritual Colonial practices. The source and platform for spread and promotion of “Assyrian” terrorism: history distortions, hatred, lies, slander, attacks, deliberate misrepresentation and manipulations to misguide the independent reader. 25-1-2007: The Arameans in Turkey unwillingly put in bad light. Turkish Supreme Court: The terrorist organization ADO/GHB “ Assyrians” added to the terror list. 8-10-2005: A disastrous decision of SUA- where are standards and values? A while back, the Arameans of the Aram Naharaim Foundation sent a Letter to the Presidents of the United States and France, and the Premier of the United Kingdom with the respect to the critical issue of the Aramaeans of Iraq. The letter focuses on the false identities projected by Western missionaries among the Aramaean Eastern Christians, who have subsequently been partly divided into ‘Assyrians’ and ‘Chaldaeans’, although their real identity is Aramaean. This criminal act of Spiritual Genocide is at the epicenter of all problems pertaining to Iraq, Syria, Jordan, Lebanon, Palestine, as it generates the riparian environment on which flows the river of Islamic Extremism. In fact, all the Muslim populations of the aforementioned countries, as well as the Arabic speaking populations of Turkey and Iran, plus the totality of the populations of Kuwait, Qatar, Emirates and the northern edges of Arabia are not Arabs, but Aramaeans of the Late Antiquity and the Early Christian times who got linguistically arabized because they accepted gradually Islam. Contrarily, the Ancient Chaldaeans (Kaldu), who lived in Southern Mesopotamia, were just one of the various Aramaean tribes who had settled in Mesopotamia in the beginning of the Neo-Assyrian times ((12th – 11th centuries BCE). Naming some Aramaeans today after a name that refers to a subdivision of the Ancient Aramaeans is an act of absurdity or anti-Aramaean hatred. Absolutely paranoid is the effort to name other modern Aramaeans as ‘Assyrians’, despite the fact that the Ancient Assyrians left no trace in Mesopotamia, following the extinction of the Assyrian Empire (614 – 604 BCE). This effort is undertaken through vast misinterpretation of sources from the Late Antiquity, and in order to distinguish the Aramaeans, who contrarily to pro-Catholic ‘Chaldaeans’, accepted Protestant missionaries’ preaching and distorted versions of bogus-History. The shocking fact that linguistically and culturally the modern pseudo-Assyrians have no relations with the Ancient Assyrians makes no sense to these extremists, who by sharing the same area (Northern Mesopotamia, and North-Western Iran) with the Kurds are definitely exposed to Kurdish expansionism. Adding to this is the incredible paranoia to claim the same past as the Kurds (Assyrian Mesopotamia); only a perverse plan that wants to push these Aramaeans to frontal clash with the Kurds would stipulate such a controversial national name for the Aramaeans. With the balance of power between Kurds and pseudo-Assyrians so detrimental against the latter, one has just to wait the moment a semi-independent Kurdish state will eliminate these populations through forced islamization. The tragic dimension will be that the forgers of the false name for this part of Aramaeans will be safe in Western Europe, and will not deploy the least effort to save them. We publish here integrally the letter sent to the American and French Presidents and the British Premier by Gabriel Sengo, President of the Arameans of Aram-Naharaim Organization, as we believe it consists in a key document with respect to several issues pertaining to present and forthcoming events in Mesopotamia and the wider Middle East. In forthcoming articles, we will focus on the issue that was highlighted in the interview we had a few months ago with the Great Aramaean Intellectual Gabriel Sengo. 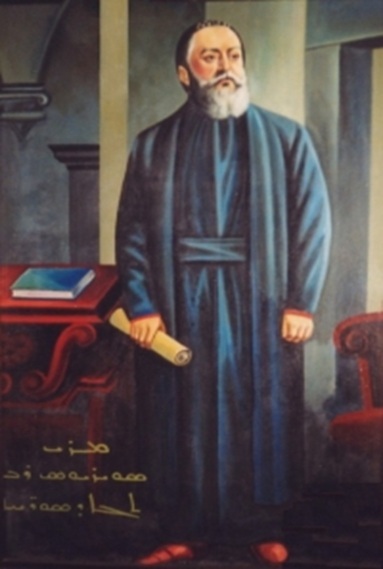 The Arameans of Aram-Naharaim Organisation is an international cultural and human rights organization to defend worldwide interests of the indigenous Christian Aramean (not to be confused with Armenians) people of Mesopotamia who have been present in the Cradle of Civilization for thousands of years. They have made a great contribution to world civilizations, in particular through their Aramaic language, spoken by Abraham, Moses and Jesus Christ. 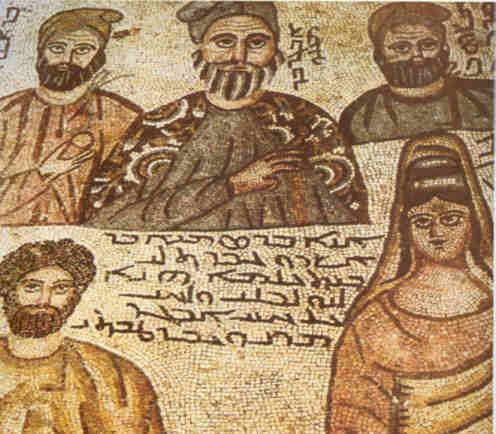 This ancient Semitic people, now divided into several denominations and spread throughout the Middle East, amount to approximately 8 million people worldwide. We are writing you to ask for your help in unifying the spiritually as well as politically multi-divided Aramean indigenous nation of Mesopotamia, in the ancient times called Aram-Nahrin in Aramaic and Aram-Naharaim in Hebrew. Both the political and the spiritual division were created through the intervention of the colonial practices of the Western spiritual and political powers. This intervention, carried out by inciting son against father, daughter against mother, family against family, village against village, has caused unprecedented hatred and sorrow within our nation resulting in their decline in the Middle-East. Furthermore, through this division they have been made vulnerable to the hostile environment of the Middle-East where they are threatened with extinction and ethnic cleansing. A divided nation is obviously a weak nation. And this division prevents not only attaining of their minimal fundamental human rights, but also gaining their social, cultural and political development and rights in both the Middle-East and the rest of the world. There are, for example, around 600.000 Arameans of different denominations in Iraq. The Western intervention in the 16th and 19th centuries, which brought fanaticism and nationalism to the Middle-East, unfortunately resulted in a part of our nation identifying itself as “Chaldeans” (since the 16th century) and another part as “Assyrians” (since the 19th century). Roughly speaking, this division was due to the spiritual war between the Western Catholics and Protestants, which was battled out at the cost of the Aramen nation, thereby planting doubts regarding their ethnic origin. As it is known to you, the Iraqi people are suffering terribly under the daily insurgence, which creates many innocent victims and causes heartrending tears and unprecedented sorrow. The situation for the Arameans is even worse, for they have no means to defend themselves and are at the mercy of those whose dictionary lacks words like “peace” and “brotherhood”. However if the Arameans were not divided and were not stuck to the unprecedented hatred implemented by the West, their chances to survive in Iraq would be much greater. Thus: Not only the fanatics of the Middle-East are to be blamed for the decline of the Aramean Christian Indigenous Nation, but also those who came from outside and presented themselves as the children of “light”, “peace” and “brotherhood”- acting in the name of the powerful Jesus of the West, who is of course different than Jesus Christ of the Bible- have damaged our nation severely. The West wishes to present itself as a civilized and shinning example to other nations and as a beacon of democracy, Human Rights standards and values, mutual respect and dignity. We believe that first and foremost, the West itself should implement and apply the standards and values, which it claims to stand for, before asking other nations to share and implement these very values. What do we want to say by this? Since the unprecedented hatred, division and identity distortion (a form of genocide) within our nation was promoted, implemented and diffused on an academic, cultural and social level by the West, we believe that it is the moral obligation of the same West to start with the healing, repairing and unifying of the fragmented Aramean nation; at least if the West takes its own standards and values seriously. We believe that you have the power, the ability and are in the position to make a start with the unification of the Aramean Indigenous Nation- which has given so much to mankind throughout history- on the political level. The same efforts that have been exhausted in the 16th and 19th centuries to cause division and hatred within our nation in the past, should be exerted in our times to unify, heal and repair the deep wounds of the past. After a time of separation, fragmentation and mutual hatred, we believe now it is time for amelioration, restoration and rehabilitation. And your involvement in this unification process is of utmost importance! Unification of the Aramean Nation should not be restricted to the various Aramean Christian denominations, but should also include the non-Christian Arameans who currently identify themselves with strange names. When the Christian Arameans and non-Christian Arameans would become aware of their glorious Aramean identity, this would cause a dramatic change in the mentality of millions of people in the Middle-East and elsewhere who blindly and fanatically follow and glorify identities which are not theirs. This change in mentality would not only help outmaneuver fanaticism and terrorism, but would also make the door open for peace and prosperity in the entire region of the Middle-East. And we believe the key to make this door open is in your hands! 11-12-2008: The hateful and malicious (spiritual) terror campaign of the Evangelical Broadcasting Channel against the Christian Aramean nation continues undiminished……. 23-12-2006: The archbishop of Canterbury and situation of the Aramean Christians in the middle-east in general and in particular in Iraq. 13-5-2005: Is there an Assyrian cause in Iraqi Kurdistan?